Published: Aug. 1, 2018 at 02:00 p.m. Updated: Aug. 1, 2018 at 03:35 p.m.
Last month, Donnie Edwards, Tony Richardson and Amani Toomer embarked on the first All-NFL Legends USO tour to Japan to visit with U.S. service members and their families at military bases. An extension of Salute to Service – the League’s year-round effort to honor, empower and connect service members, veterans and their families through a unifying lens of football and strategic partnerships – the NFL-USO Tour included taking part in a military working dog demonstration, visiting an air defense artillery unit, seeing a close-up view of aircraft, and engaging with the crew members who maintain the planes. The players spent quality time with Airmen, Soldiers, Sailors, Marines, and their families, met with installation commanders and participated in unit visits. "Getting a chance to meet the crew members who maintain the planes and seeing how much pride they took in coming to work every day was special," said Tony Richardson. "They lit up when they started telling us about the planes and how excited they were to work on an amazing piece of machinery every day." In 1966, the NFL teamed up with the USO and became the first sports organization to send players on a tour to Vietnam and other parts of the Far East. The players' July trip marked the first All-NFL Legends USO tour to Japan. "All of the base visits were great, but I really enjoyed learning about and seeing the fighter jets," said Amani Toomer. 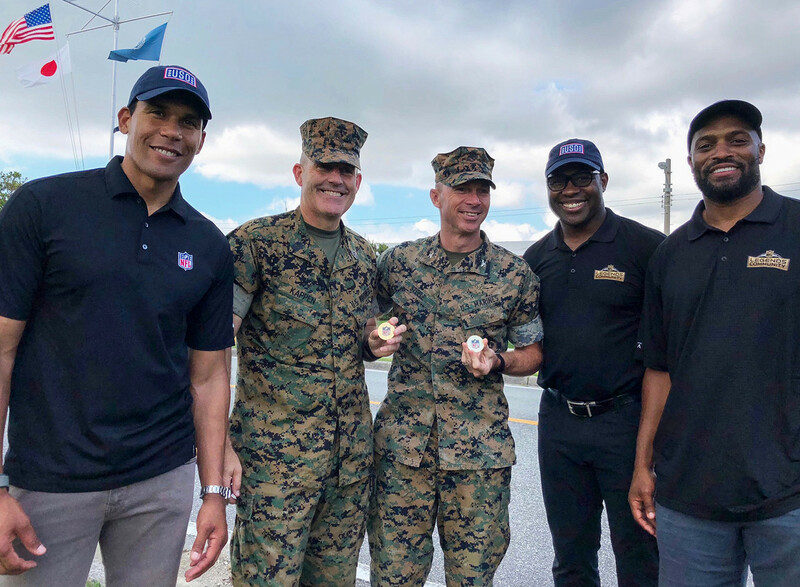 "This trip with NFL Legends is a continuation of this long-standing partnership and our joint efforts to keep service members connected to family, home, and country," said Kristina Griffin, USO Corporate Alliances Senior Director. The players were able to spend quality time with service men and women throughout the tour. "It was really refreshing to see the service members and see how much they love their jobs. They take so much pride in what they do. It reminds me a lot of what it is like to be in the NFL," Toomer said. The players toured an array of aircrafts, including fighter jets, as well as met the maintainers who keep them in the air. "For more than 50 years, the USO and NFL have partnered to bring a piece of home to service members no matter where they are in the world," Griffin said. The tour is an extension of Salute to Service – the league's year-round effort to honor, empower and connect service members, veterans and their families through a unifying lens of football and strategic partnerships. "The NFL remains committed to honoring and giving back to the men and women in uniform who sacrifice so much to protect our country," said Anna Isaacson, NFL Senior Vice President of Social Responsibility. "It was an honor to be a part of the first All-NFL Legends USO Tour," said Donnie Edwards. "It means a lot to me since I grew up in a military family. To shake hands with the troops and to recognize and honor their service personally in their place of work overseas was very impactful."